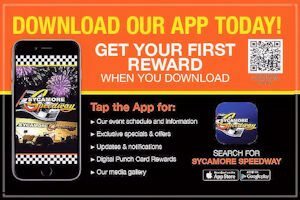 Fans – Sycamore Speedway : Midwest's Best Clay Track! Welcome to the 55th consecutive year of stock car racing at the Sycamore Speedway. On behalf of the owners and everyone involved at Sycamore Speedway, we welcome you, the fans and drivers to what we for see as another great year of fun at “the action clay track”. We are proud to announce that we are the only family owned clay track left in the Chicagoland area. During our 55th year we will do our part to give you the best in family entertainment and racing excitement. With our full field of Super Late Models, Street Stocks (f.k.a. Late Models), Pure Stock, Hornets (f.k.a. Modified Compact), Spectator, Powder Puff, Socker Stocker and Combat Compact drivers plus special events we are sure this year will be as good as ever. Look ahead and plan your next visit, 2018 has brought more fun filled kid events! We would like to give a special thanks to all those that help to make Sycamore Speedway what it is: our employees, drivers, and you, the fans, without all of your support and loyalty we could not do it. We hope that you will continue to support all of our advertisers and sponsors. We are proud to serve as your choice of summer entertainment. Thanks again for choosing Sycamore Speedway for your racing entertainment. We will do our best to make 2018 the most thrilling racing season ever!